The Dallas Mavericks and Brooklyn Nets, two teams with similar records but on different paths of late, will meet for the first time this season Wednesday in Dallas. The Mavericks (7-9) had a season-long four-game winning streak broken in Memphis on Monday, but they have won five of seven and have continued to make strides on the defensive end while integrating two new starters. Brooklyn (8-10) has lost four of six, although a 104-92 victory in Miami could provide a spark when the Nets play the second game of a back-to-back in Dallas on Tuesday. The Nets won both games in the season series a year ago. “Everything takes time,” coach Rick Carlisle told reporters after rookie Luka Doncic made the go-ahead jumper in the Mavs’ signature victory in their current run, a 112-109 win over Golden State on Saturday. Dallas has moved from near the bottom to the middle of the pack in opponents’ field goal percentage in the last two weeks and is in the upper third in points allowed at 108.6. The Mavs have held opponents under 40 percent from the field in three of the last five games. Shooting was Dallas’ issue in an 98-88 loss in Memphis on Monday, when it made only 34.1 percent and was 10-of-32 from three-point range while playing without starter Wesley Matthews and key reserves J.J. Barea and Dwight Powell. The Mavs tied a season-low with nine turnovers, but three of those came in the final 5 1/2 minutes, when they were 1-of-10 from the field as the Grizzlies ended the game on a 14-4 run. 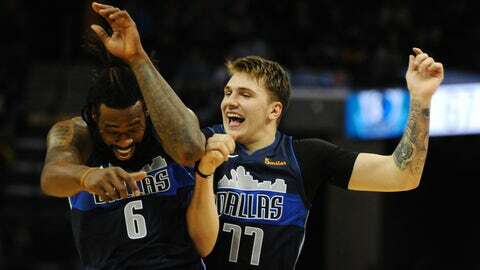 The Mavs also have taken good care of the ball recently, committing 19 turnovers total in the last two games after 19 in each of the two before that. The slower pace in Memphis probably helped. Brooklyn played stingy defense in limiting Miami to 36.0 percent shooting Tuesday, when the Heat was 7-of-32 from three-point range. The Nets has split the four games it has played without Caris LeVert, who was averaging 18.4 points, 4.3 rebounds and 3.7 assists in a breakout season before dislocating his right foot late in the first half in a 120-113 loss at Minnesota on Nov. 12. Allen Crabbe has started the last four games at off guard in place of LeVert, while guard Spencer Dinwiddie and small forward Rondae Hollis-Jefferson have continued to come off the bench. Dinwiddie has scored 70 points in the last five games and has led the team in assists in five of the last seven games. D’Angelo Russell had 20 points, nine rebounds and six assists against the Heat, and Jarrett Allen had his sixth double-double. LeVert spoke with reporters Monday for the first time since his injury. “Obviously I’m very blessed, because it could have been a lot worse,” LeVert said. No timetable for his return has been announced, but he is excepted to return this season. Crabbe had 15 points and three 3-pointers against the Los Angeles Clippers on Saturday but had only eight points against the Heat. Matthews (hamstring), Barea (adductor) and Powell (knee) are considered questionable for the game.